(Host) Several small schools in Northern Vermont and New Hampshire are getting some extra help to encourage students and their families to read more. Studies show that children in rural areas where there’s a higher than average number of low-income families are more likely to grow up with low literacy skills. It’s hoped that a three-year program involving students and their families will help address the problem. (Zind) The auditorium in the tiny Gilman Middle School in Lunenburg does triple duty. It’s also the school cafeteria and the gymnasium. One February day children’s author Marv Klassin-Landis unloaded boxes of books and spread them out on the tables. (Klassin-Landis) "This is actually out as a movie now: Hugo." (Zind) Klassin-Landis is here on behalf of CLiF – the Children’s Literacy Foundation, which is providing the books free of charge. (Klassin-Landis) "Come on up, get your books!" 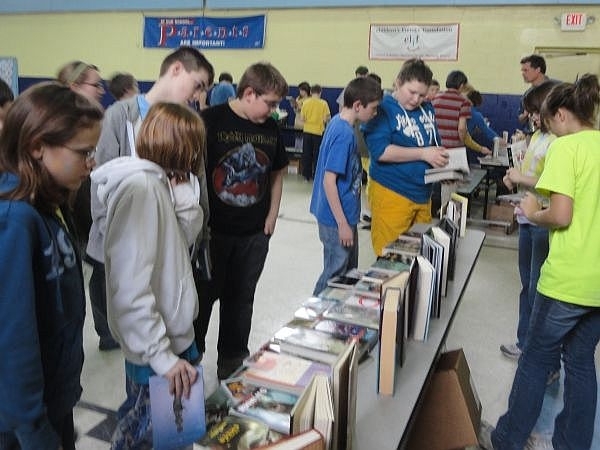 (Zind) In this Northeast Kingdom community where library resources are limited and an estimated 68 percent of families of school aged children are low income, new books are a valuable commodity. Nancy Croteau is Gilman Middle School’s principal. (Croteau)"Books really are so high priced that three-quarters of the parents of these children would not be able to afford to purchase much in the way of books. For these kids to receive two free books every time that CLiF comes, that’s huge, really huge for our kids." (Zind) Providing new books to children is just one part of a three year literacy program focusing on three communities in this area. The program is funded by the Tillotson Foundation of New Hampshire. The idea is to generate greater interest in reading and writing among students and their families. CLiF provides writers for residency programs and school visits. Organizers in each community come up with ideas to engage parents and students to read and write more. In Lunenberg parent Kat Colby is helping lead that effort. Colby says the Northeast Kingdom may be remote, but it’s changing like the rest of the world. (Colby) "To have strong literacy skills in our modern world is necessary for anything these kids go on to do, but it also enriches their lives on so many levels." (Zind) The latest school literacy event at Gilman Middle School was an open mic. A group of first graders composed short essays on one of early childhood’s most memorable events. (Child) "I lost a tooth while saying my prayers. I have a special tooth pillow that I put it in." (Colby) "They’ve never had an opportunity to do this, to share their voices. And that’s pretty potent." (Zind) Colby says there will be an evening event this month to talk with parents about the importance of reading to their children. The hope, says Suzanne Loring of the Children’s Literacy Foundation is that there will be measurable proof that the effort is working. (Loring) "Are children visiting the library more often than they did before the program started? Are parents reading aloud to their children more often than before our program started? Are kids wanting to write more in school, are they using journals more often than they were before?" (Zind) Loring says CLif will work with the towns to help them establish literacy activities that will continue after the three-year program ends. The CEOs of the two foreign companies that promise to bring more than 600 new jobs to Newport visited the future site of their operations Thursday in the lakefront building formerly occupied by Bogner ski wear.